Free Candle Spells | What is Hoodoo? Hoodoo is a term associated with a folkloric belief system that is prevalent throughout the Southern United States as well a certain major Northern United States cities such as Chicago, New York, Detroit and other cities which attracted a large African-American workforce from 1930’s to the present. In it’s simplest form, hoodoo is African spirituality combined with Native American botanical knowledge and borrows from both cultures in a blend of beliefs regarding the use of herbs, spices and ‘roots’ to affect the outcome of a situation in one’s life or to repel negative aspects or attract benevolent ones into their lives. 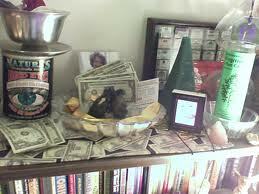 The photograph above shows a money drawing altar set for attracting money that includes a lodestone (in dish under fanned dollar bills) a money lamp (far right) a green pyramid candle, a mojo bag (kept in silver bowl receptacle upper right) and a photo of if the intended recipient of said money, as well as other traditional hoodoo items. Hoodoo was common in the lives of African-Americans from the time the enslaved ones were brought to this country to work for the booming sugar, tobacco, and cotton plantations that reached from Jamestown, VA, through the Southern United States, Cuba, Haiti, and on through Central America all the way to Brazil. It is classified in cultural anthropological terms as contagious magic because of the use of the intended ‘victim’s’ personal items such as clothing, jewelry, or even the hair from their head or a fingernail clipping. 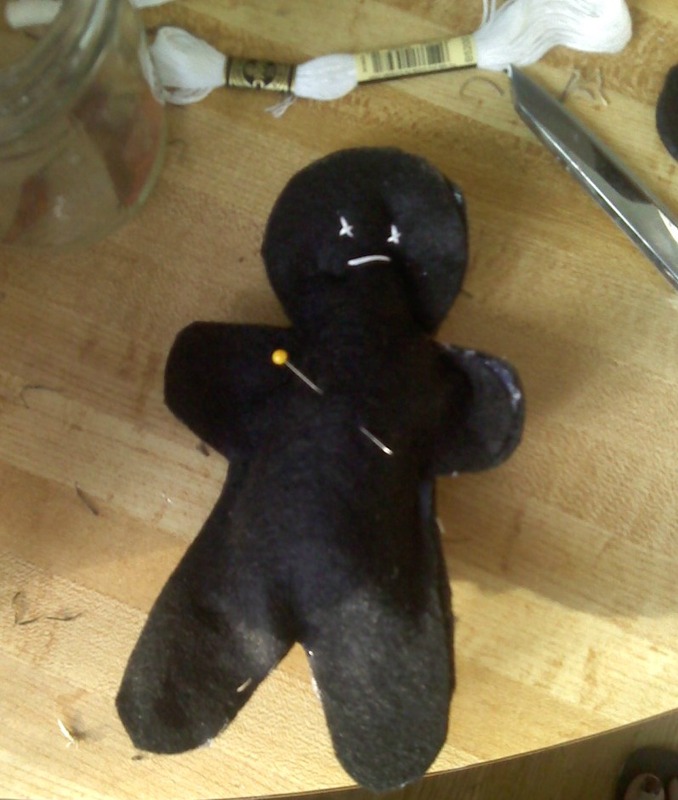 It also uses the elements of sympathetic or imitative magic by the use of items that can supernaturally affected through using an object representing the ‘victim’ as a poppet, doll baby or by using what is commonly known as a voodoo doll. To read the Wikipedia explanation of the history of hoodoo, please click here. Hoodoo is a subject of early blues music that came from the migration of Mississippi Delta and Low Country musicians who took the route of Highway 61 north to Chicago where many musicians became popular. Traveling musicians such as Robert Johnson , who referenced magical practices in his songs such as “Come on in my Kitchen”, “Crossroad Blues” and “Hellhound on my Trail”. Other musicians spoke of hoodoo in their songs, such as “Seven Sisters Blues Pt. 1″ and “Seven Sister Blues Pt. 2” by J.T. “Funny Papa” Smith, “Sold it to the Devil” by Black Spider Dumpling (a.k.a. John D. Twitty) and “Don’t put that Thing on Me” by Clifford Gibson. 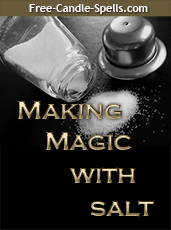 Many people practice various candle burning rituals that are loosely related to hoodoo without even knowing it. 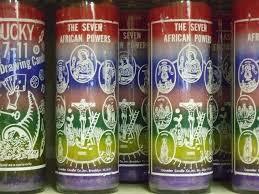 Many Spiritualist churches have anointing services and candlelight services, along with foot washing services, that are related to hoodoo, yet many Godly people will say they will not “mess with that stuff”, yet will burn 7-day “Novena” vigil candles in glass to the 7 African Powers and green money candles for added income to their wallets. Hoodoo has seen a resurgence of interest since 2003 with the publication of a book by cat yronwode called “Hoodoo Herb and Root Magic” and the many stores that have developed by people who want to rekindle the connections with their own ancestral past as well and a down-to-earth American tradition that is losing some of its best historians, the older candle shop proprietors themselves.